1961 for Keith’s to hide the decline. 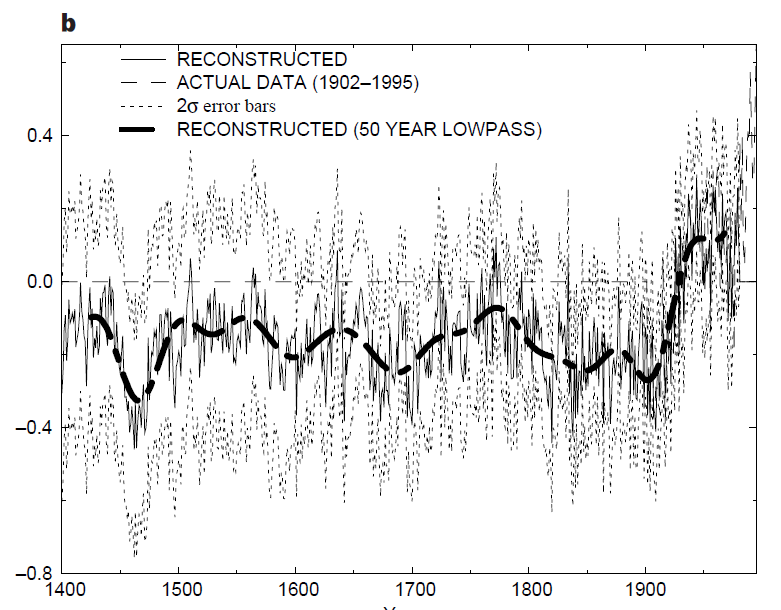 No researchers in this field have ever, to our knowledge, “grafted the thermometer record onto” any reconstruction. It is somewhat disappointing to find this specious claim (which we usually find originating from industry-funded climate disinformation websites) appearing in this forum. Most proxy reconstructions end somewhere around 1980, for the reasons discussed above. Often, as in the comparisons we show on this site, the instrumental record (which extends to present) is shown along with the reconstructions, and clearly distinguished from them (e.g. highlighted in red as here). Is this about the MBH99 smooth ? In some earlier work though (Mann et al, 1999), the boundary condition for the smoothed curve (at 1980) was determined by padding with the mean of the subsequent data (taken from the instrumental record). 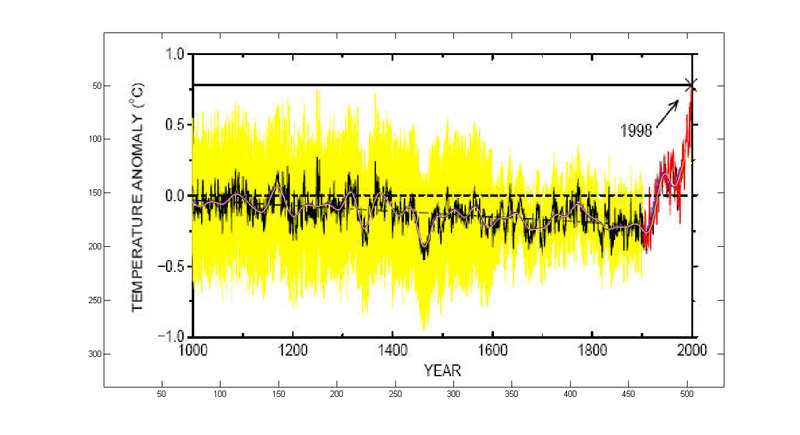 To produce temperature series that were completely up-to-date (i.e. 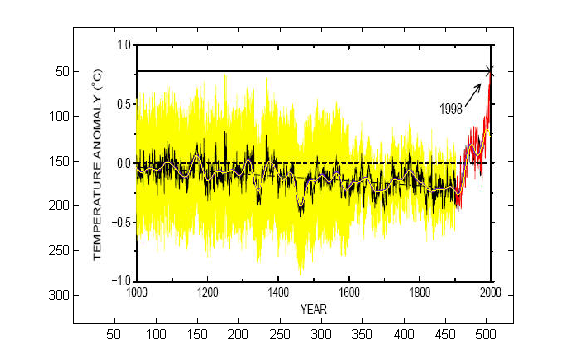 through to 1999) it was necessary to combine the temperature reconstructions with the instrumental record, because the temperature reconstructions from proxy data ended many years earlier whereas the instrumental record is updated every month. The use of the word “trick” was not intended to imply any deception. UC has corrected me on the fact that adding the instrumental series to the proxy data prior smoothing was used already in MBH98 (Figure 5b), so, unlike I claimed in #66, “Mike’s Nature trick” is NOT a misnomer. This entry was posted on February 26, 2010 at 8:27 am and is filed under Uncategorized. You can follow any responses to this entry through the RSS 2.0 feed. Both comments and pings are currently closed. I’m afraid I can’t tell what’s going on in the last graph. It doesn’t help that the original MBH98 5b (the black in your graph) is very hard to read to start with, being in B&W with too many lines at once, even though other figures in the same article are in color. It would be a lot easier to study the smoothing if the standard error lines were omitted, and if the smoothed reconstruction were a heavy solid line rather than a heavy broken line. But then, what is your green line? Since you say the red line is “zero padded 5b smooth”, does this make the green line “instrumental (81-95) padded 5b smooth”? 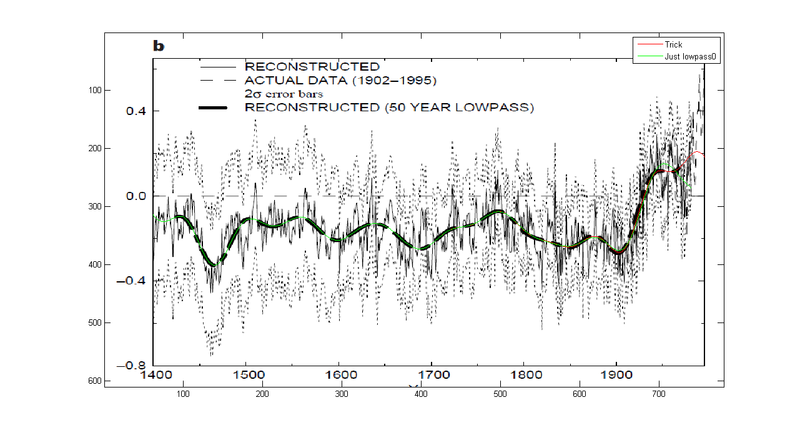 But this looks backwards — zero is below the end of the reconstruction, while the 81-95 instrumental data is higher, yet the green line is diving towards zero while the red line is climbing in the last two decades (except, inexplicably, the last few years). Then, is one of these supposed to look like the MBH smoothed reconstruction at the end? I don’t see its last few broken segments in your graph at all. It’s clear that the trick of splicing instrumental data onto a reconstruction before smoothing and then identifying the product as a smoothed reconstruction has been used several times by Jones et al. But this MBH98 5b is where the original Mike’s Nature Trick would be. Correction — my comment on fig. 7 is at http://climateaudit.org/2006/05/29/mbh98-figure-7-2/. Now I need to post the “trick” code, just a sec..
Trick=MBHsmooths1(982:996,3); % pad with instrumental (1981..1995) ..
out98t=out98t(26:576); % out98t is the smoothed recon ( years 1425..1975 ) in 5b, isn’t it ? This post is now moved to CA, http://climateaudit.org/2010/02/26/the-trick-timeline/ . Will close the comments here.